The atmosphere is hip and mellow in Kitsilano. Back in the 60’s it was a popular area for hippies, and Greenpeace was founded here. There are many young professionals and young families that live in the area now, and it is more upscale than it used to be. You will see people walking around in yoga gear heading to organic markets, and parents with their fancy strollers walking by the the hip new shops which come and go. It has a great beach as well as an enormous outdoor salt water swimming pool – almost 3 times longer than an Olympic pool! Lululemon (2113 West 4th Avenue) – High quality yoga and running wear for both men and women. Friendly and helpful staff. Offers a complementary yoga class (check the schedule on the website under Kitsilano). 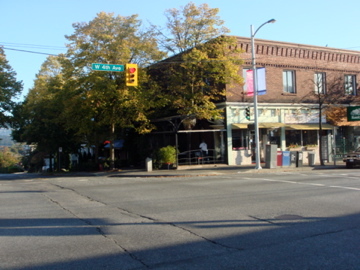 Semperviva – Kits Beach Studio #110-2201 West 4th Avenue – Popular yoga studio with a variety of yoga classes. Gravity Pope 2205 West 4th Avenue – A unique selection of trendy shoes. The North Face 2136 West 4th Avenu – High quality outdoor gear. Stylish designs. Sitka 1864 West 4th Avenue – Casual clothing made from natural materials like organic cotton and bamboo. Pacific Boarder 1793 West 4th Avenue – A good variety of surf, skateboard and ski/snowboard apparel. Spank 2066 West 4th Avenue – The latest fashions for young women. Zulu Records 1972 West 4th Avenue – A great independent music store with a large selection of records and CDs. Briers Home and Gift 2070 West 4th Avenue – A fun home decor and gift store with the latest designs. Ming Wo 2170 West 4th Avenue – A high quality cookware and kitchenware store. Just Imagine 3060 West Broadway – Fun store to bring the kids to! The friendly staff will be happy to help you find the perfect dress-up, costume or dance wear. Plen+y 2803 West Broadway – Trendy and unique selection of clothing for both men and women. Lou Lou Luv 3071 West Broadway – If you are looking for quality bargain accessories, look no further! This cute store offers a fun selection of gifts, sparkly jewelry, beauty products and more. Be sure to go next door to check out the big sister store, Lou Lou. Bishop’s 2183 West 4th Avenue – Established award-winning fine dining restaurant. There’s a reason why they have been in business for over 20 years! Octopus Garden 1995 Cornwall Avenue – Higher-end Japanese restaurant with top-quality sushi and cooked foods. Zest Japanese Cuisine 2775 West 16th Avenue – Modern Japanese cuisine prepared by a highly-skilled chef. The Eatery 3431 West Broadway – Funky, upbeat Japanese restaurant geared towards young adults. Hi Nippon 2274 West 4th Avenue – Choose a table or a shoes -off booth in this fresh sushi place. The Naam 2724 West 4th Avenue – Established vegetarian restaurant with a hippy-vibe. East is East 3243 West Broadway – Delicious Middle Eastern food and authentic chai tea. Dark candle-lit interior – perfect for an intimate date. Sunshine Diner 2649 West Broadway – Fun 1950’s style diner with golden era memorabilia. Breakfast is served all day. Sophie’s Cosmic Cafe 2095 West 4th Avenue – Popular retro-diner with an eclectic interior. Expect a line-up on the weekend. Nat’s New York Pizzeria2684 West Broadway – Award-winning pizza shop with authentic hand-tossed pizza. The best thin crust in town! Try their delicious footlong heros if you are looking for something different! Siegel’s Bagels 1883 Cornwall Avenue – Authentic Montreal style bagels – boiled and baked to perfection in a classic wood burning oven. They bring in smoked meat from Montreal every week so don’t miss their Montreal smoked meat bagel. Noodle Box 1867 West 4th Avenue – Tasty Pan-Asian cuisine served in a funky setting. If you’re looking for something quick and cheap, avoid the regular fast food joints and check this place out. Moderne Burger 2507 West Broadway – Retro-styled diner with hand-made steak burgers served with a heaping pile of fries. Vera’s Burger Shack 1925 Cornwall Avenue – Award-winning burger joint that serves a variety of specialty burgers, hot dogs and sides. Wash it all down with one of their handmade milkshakes. Terra Breads Cafe 2380 West 4th Avenue – Perfect for a light lunch or snack. They have delicious breads (Italian cheese, green olive and sourdough, to name a few), pastries (try their blueberry bread and Belgian chocolate brownie), soups and sandwiches. Patisserie Lebeau 1728 West 2nd Avenue – Authentic Liege waffles made with real butter and natural ingredients. Make sure you try one of their baguette sandwiches – the bread is baked to perfection! Thomas Haas Fine Chocolates and Patisserie 2539 West Broadway – Fine handmade chocolates and decadent pastries made by a true master. Grounds For Coffee 2565 Alma Street – The most popular cinnamon bun in town! Many local cafes serve their buns, but be sure to visit this particular cafe to get them fresh. They are soft, gooey and will melt in your mouth. Viva Fine Foods and Bakery 1555 Yew Street)- Quaint cafe with friendly staff and over-the-counter service. Their sweets look good and taste even better! Taco Shack 1937 Cornwall Avenue – Large portions and very fresh ingredients served by personable staff. Nando’s Flame Grilled Chicken 1955 Cornwall Avenue – Easily the best chicken in town. It is grilled and served with your choice of sides. Scoop! Frozen Yogurt 2050 West 4th Avenue – Tart frozen yogurt served with your choice of toppings and charged by weight. Their most popular topping is their mochi (made from glutinous rice). They are very light and marshmallow-like – be warned, it’s addictive! Cellar Restaurant and Jazz Club 3611 West Broadway – Top jazz lounge with live performances, food and a great wine menu. Darby’s Pub 2001 MacDonald Street – No-nonsense neighbourhood pub. Abagail’s Party 1685 Yew Street – Popular and stylish casual dining spot. Intimate setting and a great place to have cocktails with friends. Between West 4th Avenue and West Broadway, there is a great variety of restaurants and shops, the people are friendly and the beach is beautiful during the summer months! The Granville Island Hotel is located on Granville Island; this boutique hotel is a hidden gem. 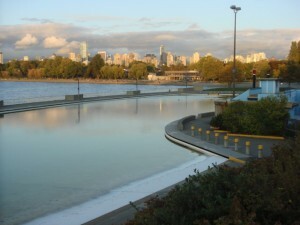 Kitsilano Community Centre 2690 Larch Street – Kitsilano Community Centre has a full-size indoor ice rink open from October to May for public skating and ice skating lessons. The centre also has a full court sized Gymnasium, Dance Studio, Youth Lounge, Senior’s Lounge, Special Needs Youth Program and a Fall-to-Spring licensed Preschool. Recreation programs provided include Workshops, Art Programs, Group Fitness classes, Yoga, Pilates, Dance, Martial Arts as well as many other active and informative programs. There is a fully equipped, air-conditioned, 5000 square foot Fitness Training Facility with sauna, whirlpool and personal training packages are also available. Kitsilano Pool at Kits Beach (North end of Yew Street) – This heated salt-water outdoor pool is 137 metres /449 feet long! It takes just 12 laps to swim a mile in this wonderful pool which is situated right at the beach. Vancouver Folk Music Festival Held on the 3rd weekend in July each year at Jericho Beach Park, the Vancouver Folk Music Festival offers an eclectic range of music in an outdoor multistage venue.